Michael Kopp is an Upper School Social Studies teacher at the American School of Paris. Despite difficulty in not having answers to his students’ questions about the attacks, he and his colleagues had a job to do Monday morning: teach children. Monday morning did not seem like it was going to be an ordinary day. After the morning faculty meetings and student assemblies had brought the community together to reflect on our collective response to Friday night’s terror attacks in Paris, it was time for the school day to begin. I started my first class by telling students I was happy to see them — in a way that was perhaps more heartfelt than on most Mondays — and then, I started teaching my history class as I normally do. Educators are no strangers to the challenge of helping students navigate the complex set of emotions and ideas that emerge at times of terror and crisis. History teachers, in particular, seem to find themselves asked for explanations of complex world events. Yet history does not necessarily hold the answer to events like those of Friday night in Paris. An historian who tells you that history can help predict the future is most surely a charlatan, and the historian who understands history only through the lens of current events will be disregarded as narrow and naive. It is this situation that brought to mind a lesson I learned as a college student preparing to become a teacher. As someone who has devoted my career to educating young people, it is painful to have no answers for students in times like these. I have thought about this idea periodically over the last decade of my teaching career in U.S. public schools and in international schools around the world. Yet these words never challenged me so much as in the last ten months. 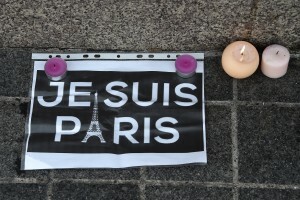 As a history teacher at the American School of Paris, my colleagues and I have been faced with the unenviable task of trying to make sense, both for ourselves and our students, of two different acts of terror in our home city. As I’m sure history teachers around the world can attest, there is something about our subject that draws questions from students about the current state of our world, and on Monday evening I received an email from a student remarking that she felt like these events were a defining moment. She wanted to know if we could talk about them in class the next day. As someone who has devoted my career to educating young people, it is painful to have no answers for students in times like these. It was this sense of despair in the wake of Friday night’s terror attacks in Paris that gave me pause to reflect on the words of my mentor teacher. And upon reflection, I realized that he might have been a bit wrong. Because on Monday morning I had no answers to give, but I had a very important job to do. I needed to teach history the way that I teach it every day, and so I started teaching. And my colleagues started teaching, too — they taught calculus, and biology, and computer science, and literature. My colleagues in the Lower School taught kids how to read, to play musical instruments, to make art. We needed to carry on with what we do best as teachers. I was struck by the realization that I should not look for an explanation within my subject, but I should look outward to the significance of our work as teachers and the importance of what we do every day. History and Humanities teachers have no corner on the market when it comes to the values of our society — those values that are challenged by acts of terror. We may safeguard some very precious truths about what it is that makes us human, but we are only one piece of the mosaic. And this is where my mentor got it wrong. The horror and tragedy of acts of terror designed to target innocent people cannot be explained by looking only inward to construct some meaning or provide some answers, and they surely cannot be explained by a group of well-meaning social studies teachers. But, as the American activist and history teacher Howard Zinn said, to live in defiance of all that is bad around us is itself a marvelous victory. And by teaching on Monday morning, my colleagues and I at the American School of Paris made a very clear statement of defiance against the “bad” that was facing our community. We could not answer all of our students’ questions, but we could continue to teach and to build upon our shared values in a way that flies in the face of acts of terror.